I don’t think it’s stopped snowing for more than a few hours since Wednesday afternoon – not that I’m complaining that much. We’ve been lucky and school’s been canceled for the last three days. The snow is beautiful, but I hate driving in it. 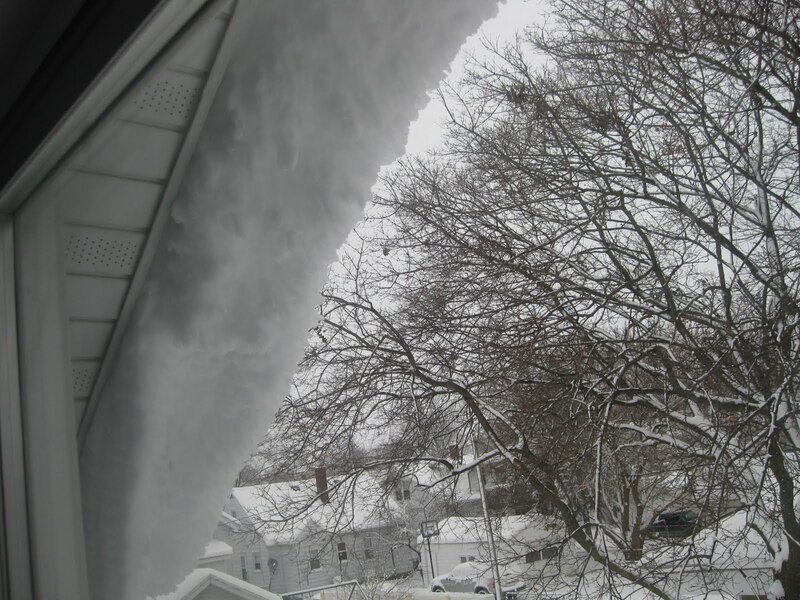 This is all the snow on my roof – taken from an upstairs window. I’m not going out unless I have to! 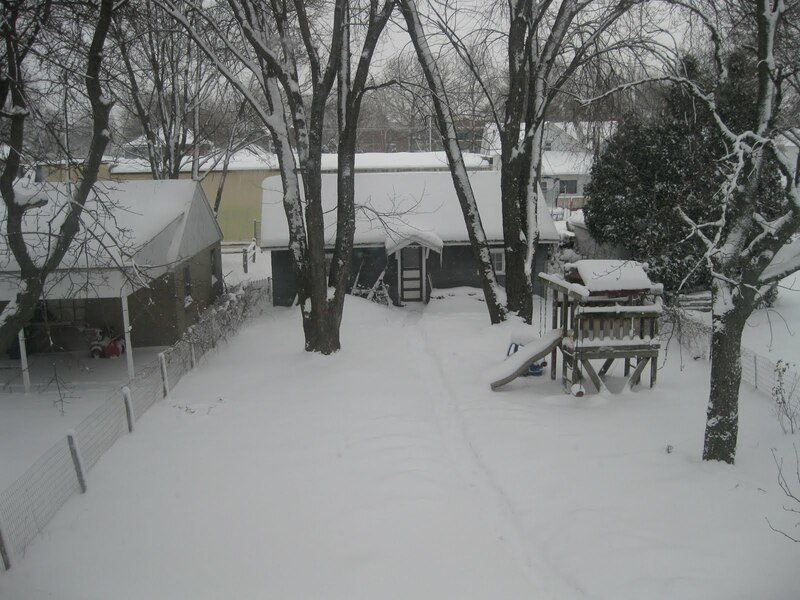 This is a view of my backyard – the little gray building is my garage and the other thing is the swingset my husband built about twelve years ago. The boys are so big, it doesn’t get a lot of use anymore. The last picture is taken from my front door. 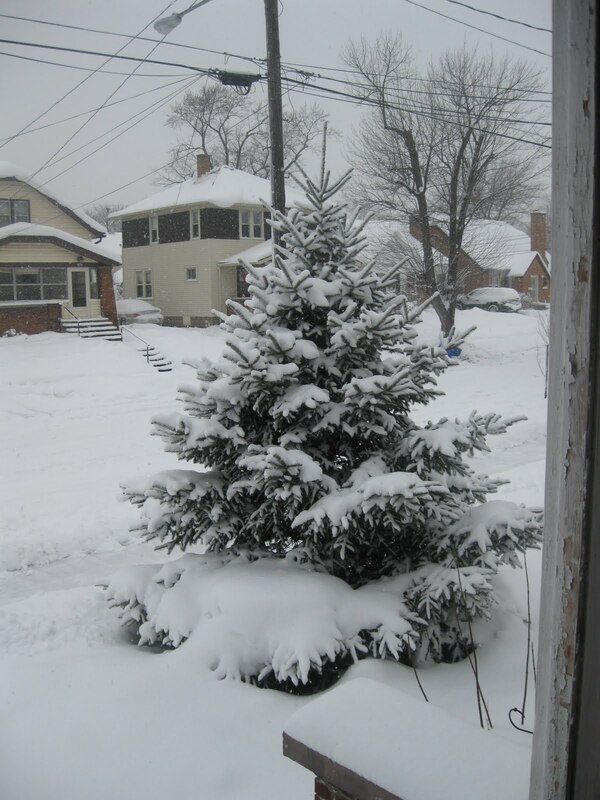 We planted that tree almost twelve years ago when it was only about eight inches tall. Wow, three snow days and it's only December. Gonna be a looooong winter. Time to cut down that puppy and bring it in the house for Christmas! Okay, okay, don't hyperventilate. Donate it to a homeless shelter, instead. No? All right, leave it alone, but don't say I didn't warn you against rogue evergreen gangs. Throw some lights and stuff on that bad-boy – perhaps the rogue evergreen gangs will be less inclined to mess with it. You must be getting A LOT done at home, huh? I'm getting cold just Looking at your pictures. You did a wonderful job taking pictures, their perfect. it looks beautiful. Ashley says she wants to roll around in your back yard but she does Not want to be cold! Your tree is Sooo cute! and No cutting of the tree! we need more trees in the world… Ohoo my crunchy granola side is showing. I love the pictures! This time o fyear always makes me feel homesick. I miss winter. Nice pictures. The entire reason I moved west! We have 15 feet of snow, but only up in the mountains where it belongs. And now that the floods have passed, I'm running in the clear. But my kids definitely wish it snowed just a bit more often. Awww, great pics! I love the snow. Everything seems so SILENT. Like you I hate to drive in it though. Best to stay home. Your backyard creeps me out.